meant the end of the settlements that had survived the great earthquakes. After the 13th century the whole province became subject to the Ayd�n and Mentese Emirates. In the 15th and 16th centuries the fertile soil of the area attracted new settlement and the site of the ancient city of Aphrodisias was occupied by the village of Geyre. Here too were found fairly large jars known as pithoi used for the storage of wheat and other provisions as well as a considerable amount of pottery fragments. The finds also include a number of stone implements, stone statuettes, figures with the faces of owls and fat female idols as well as various weight-measuring instruments. The excavation area known as Pekmez H�y�k to the east of the acropolis yielded pottery of the late neolithic, late chalcolithic and early bronze ages, together with two Kilia figurines.In the Late Hellenistic period the city developed more particularly in the area surrounding the agora. There is no question, however, of any genuine town planning. Neither the Temple of Aphrodite nor the Sebastion conforms to any regular city plan. 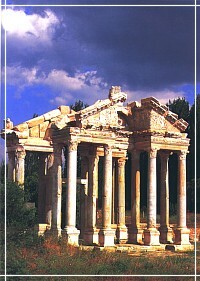 One of the most attractive features of Aphrodisias is the ornamental gate constructed in the middle of the 2nd century. The name Tetrapylon refers to its being composed of four groups of four columns. The entrance lies to the east. The front row of Corinthian columns with spiral fluting look out on to a street with north-south alignment. The second and third columns of this fourfold structure are surmounted by a semicircular lintel with relief figures of Nike and Erotes amid acanthus leaves. The process of repairing and re-erecting the Tetrapylon columns was completed in 1990. The baths constructed in the 2nd century during the reign of the Emperor Hadrian lie to the west of the Portico of Tiberius. This complex consists of a large central hall, probably the caldarium or hot room, surrounded. by four large rooms, the tepidarium, s��datorium, apoditerium and frigidarium (warm room, sweating room, dressing room and cold room respectively). Following the collapse of the upper sections of the cavea in the 7th century earthquake and the partial filling up of the auditorium the Byzantine inhabitants covered the orchestra and stage buildings with earth and built houses over it, at the same time surrounding the acropolis with a wall.The most interesting and remarkable of the finds discovered in the excavations was the Zoilos relief. Zoilos was a manumitted slave of Octavian who played an influential role in fostering good relations between Aphrodisias and Rome and who succeeded in having the city exempted from tax. The proscenion and logeion sections of the theatre were presented by Zoilos as a gift to Aphrodite and the citizens of Aphrodisias. The Sebastion is a most remarkable discovery, not only as regards the excavations in Aphrodisias but in the whole context of classical archaeological excavation. When the building was first unearthed in 1979 it appeared to have no relation to any other building but, as excavations were carried down to deeper levels, it became apparent that this consisted of a temple dedicated to the cult of the Emperor Augustus (Sebastos is the Greek equivalent of the Latin Augustus) and its surrounding complex. are slightly convex, giving the whole a form rather suggesting an ellipse. In this way, the spectators seated in this part of the stadium would not block each other's view and would be able to see the whole of the arena. The stadium was specially designed for athletic contests, but after the theatre was damaged in the 7th century earthquake the eastern end of the arena began to be used for games, circuses and wild beast shows. During the Roman period the stadium was the scene of a large number of athletic competitions and festivals.